Welcome to real food day ! The next 100 days will be all about eating real food--nothing processed, nothing "frankenfood", and lots and lots of delicious, real food. I live in a northern area of the world, where there is an abundance of local fresh, gorgeous fruits and vegetables available in the growing season, and only local fresh snow the rest of the time. Most of the fruits and vegetables available during the winter months are either frozen, or imported. There are a few autumn harvests which are available through the winter months--winter squash, potatoes, kale--and I'll definitely be availing myself of those. The rest, unfortunately, I will have to use non-local things, which means it's not 100% the same as the original idea of 100 Days of Real Food, but as this blog is about doing things in the real world, that's reality for me. :) Doesn't mean it's not worth doing! I'm certainly not willing to eat no fruit or veg until next spring. So! 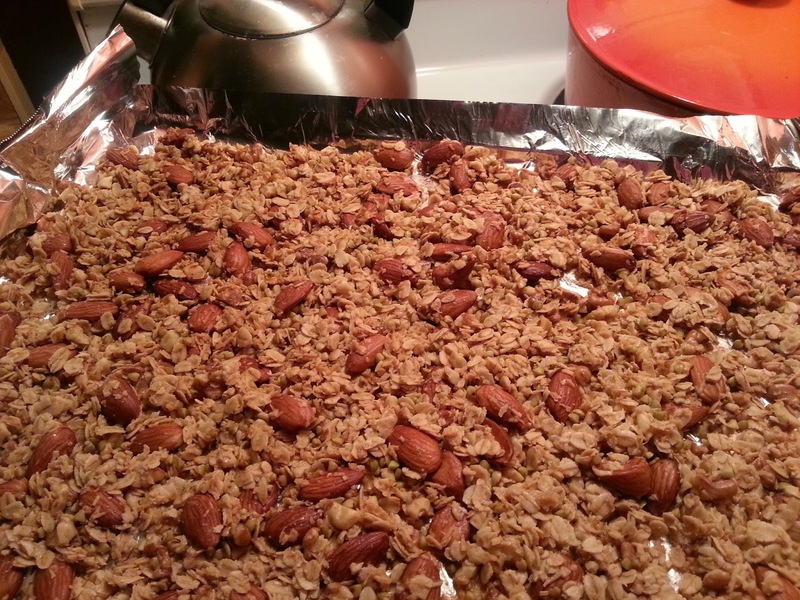 On Saturday I thought I'd try my hand at making granola. Commercial granola is notorious for being incredibly unhealthy, and somehow has many ingredients which are unpronounceable, which of course means that it has no place in my 100 days of real food! All ingredients are adjustable, or swappable. You don’t need to stick to the recipe exactly, but this version is very good, if I do say so myself! Mix dry ingredients (except salt and nutritional yeast) together in a large bowl. In small, microwave-proof bowl, combine coconut oil, sea salt, nutritional yeast and maple syrup. Microwave for ONLY about 5 seconds on high—just long enough for the coconut oil to liquefy. Mix wet ingredients thoroughly, and add to dry ingredients. Mix all ingredients until well blended. 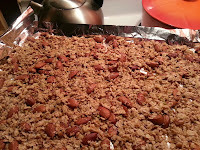 Spread out mixture onto a cooking sheet, making sure it’s even. If I do say so myself, it was delicious! I was really surprised, actually--I fancy myself a decent cook, but I only really learned in the past 3 years how to cook. So I guess I'm still kind of a newbie! And this experience will be FAR beyond what is my comfort zone--I'll be learning new things, creating/discovering new food combinations, and hopefully creating/becoming the person I've always wanted to be, and living the life I've always wanted to live. Today, which is Day 1 of 100 Days of Real Food, I'm very sore and stiff from walking my first-even half-marathon, but I'm not going to let that stop me from sticking to my commitment! This morning for breakfast I had egg breakfast burritos and a sliced-up orange. The eggs are antibiotic-free, the tortillas are whole-wheat, and the milk in the scrambled eggs and in my tea, is organic. 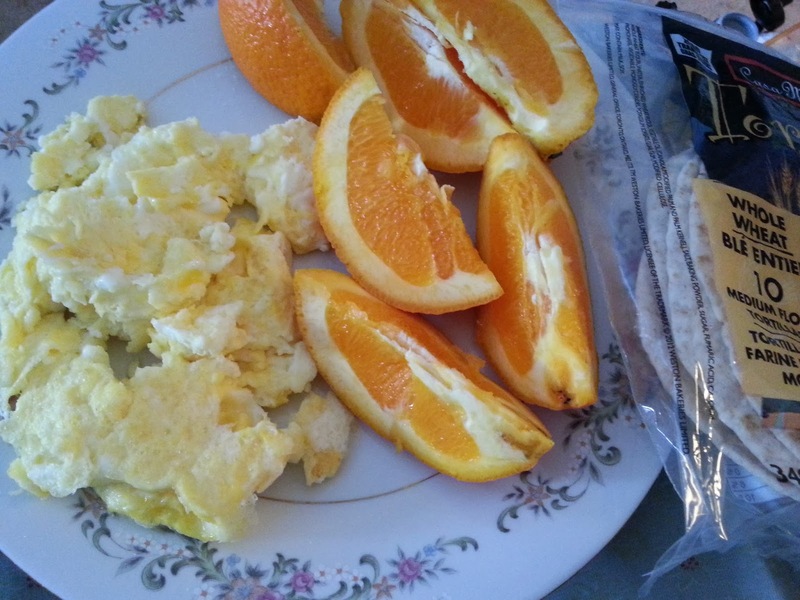 I got up late today, owing to my looooooong walk yesterday, and only finished the orange portion of my breakfast at 12:45, so other than maybe a little snack in the late afternoon, I won't be eating another meal until dinner time. On a related note, my commitment to eating only real food for 100 days also includes doing it on a budget. For me, that's $80 CAD. This means some adjusting for me, since I've gotten used to getting my breakfast to go from a local coffee shop (not very healthy), and spending about $5 per weekday on it, which is definitely not in the budget any longer! So I'm going to have to get used to making breakfast at home, either that morning, or the night before. It's been many years since I've done this, so it will definitely be a challenge! So far I've not used much of my budget, partly because I haven't done a proper shopping trip yet, but also because I want to use what I already have in my fridge and to a lesser extent in my freezer. There's a lot of stuff in my fridge which needs to be used up (broccoli, onions, 3/4 of a honking butternut squash that I got for $1.50 (!!!) from the farmer's market last week, about 8 oranges, the same amount of apples, 1 bunch of organic purple kale which I hope is still good, a few lonely peppers, and some other stuff which may or may not still be good, which was pushed back to the dark, scary region at the back of my fridge). My hope during these 100 days is also that I no longer forget about/waste fresh food in my fridge! I'm finding the idea of a full 100 days a bit daunting, but I'm also excited. I can feel my creative juices starting to flow for the first time in a long time. I'm slightly worried about how other people in my life will respond to this, as I know from past experience that people have pretty varying opinions of food, and in some ways it's just as much of a minefield as talking about religion or politics. I can't control that, and I'm not going to try to. This is what I'm doing, I'm not forcing anyone to do it with me, nor will I judge how others are eating, and it's going to be amazing!